Borrowers pick up literature on eligibility requirements for Making Home Affordable refinance and loan modification programs at the government initiative's fair Aug. 21 at Sheraton Chicago Hotel & Towers. 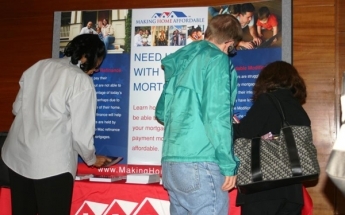 The event allowed troubled homeowners to visit booths occupied by representatives from major lenders to determine if they could proceed with a mortgage workout. Photo by Jessica Young. Mortgage lending to black and Latino people has declined for at least the fifth consecutive year in the U.S., threatening to erase homeownership gains and widen the nation’s wealth gap. –¢ Nationwide, black people seeking home loans were rejected more in 2008 than any other racial or ethnic group–”48 percent of their applications to purchase or refinance owner-occupied homes were rejected. That’s 22 percent more than the rejection rate for white people, 21 percent more than the rate for Asians and 6 percent more than the rate for Latinos. –¢ Among five of the nation’s most populous metropolitan areas, African Americans seeking to buy primary homes fared worst in Chicago, where 41 percent were rejected. Black people fared the best in Philadelphia, where 25 percent were rejected. Black people seeking to refinance their primary homes were rejected at similar rates in each of the five cities except Dallas, where, at a 61 percent rejection rate, they fared five percent worse than the four-city-average. –¢ Latinos seeking to buy primary homes in New York were rejected at a higher percentage, 34, than in any of the other four metropolitan areas. Latinos living in Philadelphia had the lowest rejection rate, 21 percent. Latinos seeking to refinance their primary homes fared worst in Dallas, where at a 60 percent rejection rate, they fared 10 percent worse than the four-city-average. Lenders have been excoriated for their lending practices, especially in the last few years with attorneys general alleging that they have discriminated against black and Latino people by steering them into high-cost loans. Illinois Attorney General Lisa Madigan filed two such suits, one against Countrywide in 2008 and another against Wells Fargo in July. Housing experts say racism is not behind. Housing experts say black and Latino credit scores, not racism, are behind the racial disparities in approval rates for home loans. When calculated on a 100 point scale, the average credit score for black people is about half the average credit score for white people, according to a 2007 report by the Federal Reserve Board. The average credit score for Latinos is about three-fourths that of white people, the report says. African Americans and Latinos often have lower credit scores because they tend to use credit less, said Herman Brewer, executive vice president of the Chicago Urban League. They are more likely to use cash for transactions and, as a result, don’t develop a credit history, he said. “A number of people in our community who are gainfully employed, [have] done reasonably well, been reasonably successful, but don’t have credit cards,” he said. Wells Fargo officials said many factors contributed to the outcomes of their loan applications. “It is simply wrong to compare denial rates without considering factors such as credit score, debt load, loan-to-value ratios, payment history and occupancy status –” all of which are a part of the transaction and most of which are not available in HMDA data,” said Tom Goyda, Wells Fargo Home Mortgage vice president of communications, in a written statement. In 2007, the last year for which data were available, Wells Fargo Bank was among the 20 lenders receiving the most loan applications in Chicago from black and Latino people. That year, Wells approved 28 percent more purchase loan applications from white people than from black people and 16 percent more from white people than from Latinos. Countrywide Home Loans approved 30 percent more purchase loan applications from white people than from black people in 2007. This was the highest discrepancy in approval rates among any of the 20 lenders receiving the most applications from black people in the Chicago area. The disparity between white people and Latinos was lower, but also high. Countrywide approved 20 percent more purchase loan applications from white people than from Latinos in 2007, the second highest discrepancy in approval rates among any of the 20 lenders receiving the most applications from Latinos in the Chicago area. Bank of America bought Countrywide in July 2008 and declined to comment on any of Countrywide’s operations before then. JPMorgan Chase Bank & Co., which also was among the group of 20 lenders receiving the most black and Latino purchase loan applications in Chicago, approved 11 percent more of those loans from white people than from black people and 6 percent more to white people than Latinos. That’s not because loan officers are racists. According to Tom Kelly, a media relations representative with JPMorgan Chase, mortgage applications are reviewed based on a borrower’s payment and credit history, work history, assets, debt, down payment and the property they own or want to buy, he added in a statement. The inability to buy a home will undermine black and Latino families’ attempts to build wealth, already a struggle. According to the Fed study, for every dollar in wealth the median white family had in 2007, the median black family had one dime. Several years earlier, in 2004, the black median family had 14.5 cents for every dollar accumulated by the median white family. According to the Corporation for Enterprise Development’s 2007-2008 Assets and Opportunity Scorecard, 15.5 percent of all Americans and 26 percent of minorities have zero or negative net financial assets. Historians and wealth gap experts say minorities are behind the eight ball on accumulating assets. Black people are particularly affected because of the legacy of slavery, the era of Jim Crow, institutionalized racism and redlining. First-time homebuyers frequently get help from their parents when making a down payment. On average, minority families don’t –” they inherit less because previous generations were not allowed the usual avenues of economic advancement until the 1968 Civil Rights Act passed. Thomas Mitchell, a law professor at the University of Wisconsin Law School, said there were substantial historical barriers placed in the way of minorities seeking homeownership. After Reconstruction, there were exclusionary racial zones, or enforceable restrictions that prevented white homeowners from selling to black people. In 1917, the U.S. Supreme Court deemed those zones to be unconstitutional. Racially restrictive covenants proliferated in their stead. These private agreements among homeowners prevented white people from selling their homes to people of other races. The covenants were not ruled unconstitutional until 1968. Even after the covenants were lifted, banks continued to deny mortgages to borrowers in minority neighborhoods under the guise that the properties were worthless. The practice was called redlining and was explicitly banned by the federal government in 1977. Only then, did minorities begin to enjoy widespread access to mortgage loans. In the mid-1990s, subprime and predatory loans emerged and expanded minority homeownership. From 1995 until 2004, homeownership rates grew almost 7 percent for black people and about 6 percent for Latinos, according to a 2007 report by the Washington, DC-based think tank Joint Center for Political and Economic Studies. However, much of that expansion was built on a house of cards. Subprime and predatory lenders often put black and Latino people into homes without requiring proof of creditworthiness and by overcharging them for interest or penalizing them for pre-paying their mortgages. Minority borrowers were nearly a third more likely than white borrowers to be steered into high-interest loans–”even in instances where they qualified for a prime product, according to the Insight Center for Community Economic Development. Now, many of those borrowers are in foreclosure. 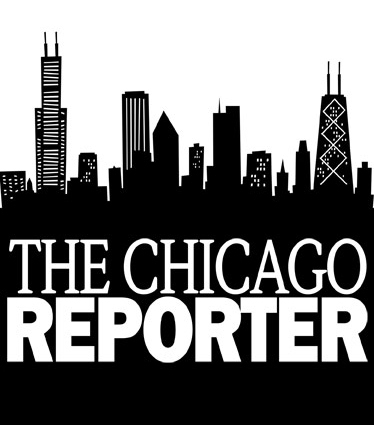 Sixty-five percent of all 2008 foreclosures in Chicago were in minority-majority census tracts, according to a 2008 report published by the Chicago-based National Training and Information Center, a non-profit that trains and organizes community activists. Housing policymakers and advocates fear the homeownership rates for black people and Latinos will continue to shrink, even as the housing market shows signs of recovery. Sales of new single-family houses grew 0.7 percent in August, following three months of gains, according to the Commerce Department’s U.S. Bureau of the Census. Some housing programs have been created to expand home ownership among the nation’s lowest earners. One tool in particular is called an individual development account. The programs are funded by local and federal government agencies, private companies, nonprofits and churches or charities, which match between $1 to $6 for every dollar participants invest in savings accounts. Donors and banks have been reluctant to participate. Organizations are having a hard time raising the matching funds and banks don’t derive much profit from poor people’s small deposits. And, banks participate not only for initial profit motives, but for the opportunity to build a potential customer base, said Nancy T. Montoya, the senior regional community affairs manager for the Federal Reserve Bank of Atlanta –” Gulf Coast Region “IDAs are–¦one of the best arsenals in our toolbox. We need to expand access to these remarkable programs and institutionalize them,” Montoya added. The City Council housing committee chairman went above and beyond his record of siding with landlords by filing an affidavit supporting a building owner who has donated thousands to his campaign. Recent efforts to preserve three single-room occupancy hotels in Uptown reveal the city’s lukewarm commitment to maintaining them as a safety net for low-income tenants. The conversation on affordable housing in Chicago is changing, especially among mayoral candidates, but the realtors lobby still holds great sway.